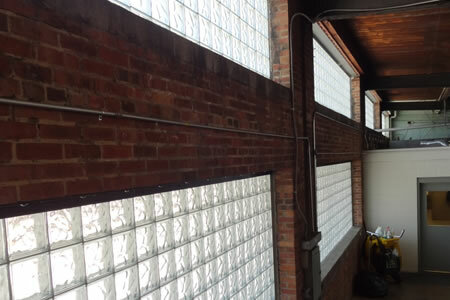 Cold weather will soon be here and if the windows of your current office, commercial or factory space are in desperate need of an update, glass block not only makes great first impression, but offers the added benefit of being more energy efficient than metal or wood framed windows. As a nationwide wholesaler and regional installer of glass block, Innovate Building Solutions offers many options to suit your specific needs. Reduced heating and cooling costs. Since many older framed windows have single panes and can be susceptible to air leakage, it’s important for businesses to ensure that their dollars are not going right out the window…literally! The commercial glass block windows from Innovate Building Solutions are mortared together and can reduce overall energy costs, especially during harsh winter weather or summer months. Low maintenance and durability. The mortared joints between the glass blocks can easily be maintained by your maintenance staff, which can also perform any necessary replacements down the road. Environmentally friendly. Composed of natural materials, glass block windows have a long life span and are a great “green” option, while still being cost effective. Customization options. Innovate Building Solutions offers a wide variety of options to increase security with solid and fire rated glass blocks, enhance privacy with frosted glass block, or even add color and design for a look that is as distinctive as your business. Additionally, glass block windows transmit generous amounts of natural light into a space, creating a warm, inviting workplace for both employees and customers, which can also improve productivity. Additional savings. We offer nationwide shipping for all of our prefabricated panels at no cost to you, saving you additional money. As a company with more than 35 years of experience in the industry, we pride ourselves on excellent customer care and satisfaction and unlike similar distributors, our work does not end upon shipment. On a nationwide basis, the expert team at Innovate Building Solutions will work directly with building owners and contractors to ensure that our prefabricated systems are successfully installed and your expectations are exceeded. For more information about our nationwide glass block window systems, visit the Innovate Building Solutions website or contact us at 1-877-668-5888. We also offer installation and assistance on a regional basis at our branches in the Cleveland and Columbus.